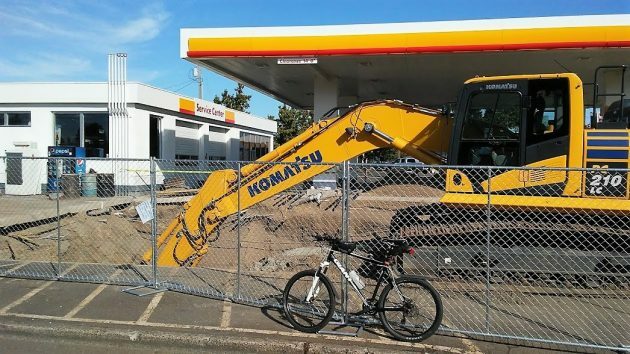 Construction equipment is silent at Courtesy Corner Shell on Wednesday afternoon. Ronald L. Smith, the owner of Courtesy Corner Shell, hopes to be able to reopen the Albany station around Nov. 1 with new underground tanks, but there’s been a snag in the project over a building permit. Smith has owned the station at 1515 Calapooia St. S.W. since 1962. He told me Thursday that he is having to replace the underground tanks because his insurance company would not renew his million-dollar policy because of their age. The oldest of the tanks date from 1953, though some are newer. The old tanks were opened in 1993, inspected, lined and equipped with cathodic protection against corrosion, and when they were pulled out last month, they were solid and had nothing wrong with them. Also, Smith told me, the tanks at his station pass daily tests. But still, they had to be replaced. The business employs 15 including a bookkeeper, a mechanic and a squad of high school and Linn-Benton Community College students. The station closed and construction started Sept. 18. 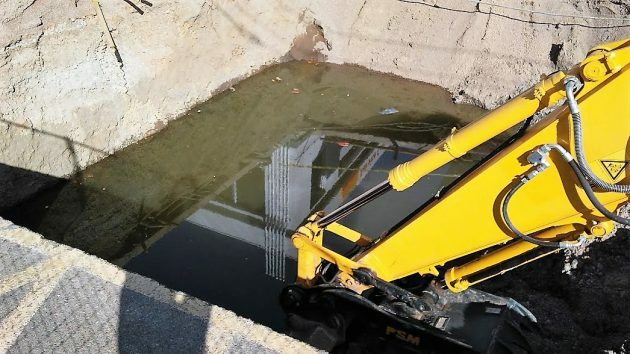 Smith understands his contractor had checked and was told that no building permit would be needed, an apparent misunderstanding considering the engineering and other requirements for underground fuel tanks. In any case, the city building official and a fire marshal came and shut the work down until a building permit is in hand. When I checked at City Hall Thursday afternoon, permit technician Jordan Sprague told me no application had yet been filed. When it is, he said, it will get prompt attention. The station already does have permits for the electrical work involved in rewiring new pumps and replacing the canopy lights with LEDs. Smith would have liked to accomplish all this earlier, but with all the rain last winter the water table was too high. In February and March the ground water rose to within 4 or 5 feet of the surface, and doing the tank replacement would have required pumps. Even now, after a long dry summer, water has filled the bottom of one excavation that’s roughly 10 feet deep. Water fills the bottom of this excavation at Courtesy Corner Shell. My family also buys fuel from Courtesy Corner and cannot wait to be able to do so again. As one of two stations (that I know of) which carries non-ethanol gas, I really hope that they’re open on Mr. Smith’s timeline. I run a small farm operation and Ron’s place is where I go for our fuel. The good old fashioned respect the employees have for the customers is a rare thing and worth my business loyalty. Hope they reopen soon. I hate having to wait at gas stations for an attendant to pump gas. Even though they are not the cheapest place in town, I often get my gas here, because they are the fastest and have the best service in town. Well worth the little bit extra at the pump. I hope lots of Albany folks will take their fuel business to Courtesy Corner Shell once the upgrade is completed, to make up for the time lost for being closed. Ron and his crew certainly deserve your business and you’ll receive the best service every time you go. My folks have gone there since 1962, I’ve gone there since getting my driver’s license in 1967! Having a Fred Meyer Rewards Card gets you a nice discount if you shop Freddie’s! Always seems fair price for clear gas.